In addition to the route map of the Stratford upon Avon & Midland Junction Railway (SMJ) stations within the County of Warwickshire we have provided below other links to pages relating to the SMJ and its constituent companies. Our reason for doing this is because the SMJ was the only railway, other than the Harborne Railway, to have its headquarters located within the county. Whereas the Harborne Railway was the only railway which operated entirely within the county and paid dividends to shareholders up to grouping on 1st January 1923, it was operated from the outset by the London & North Western Railway and as such had no specific character of its own. The SMJ however, had two constituency companies operating within Warwickshire with the Evesham, Redditch & Stratford-on-Avon Junction Railway being totally within the county albeit being subservient to the East & West Junction Railway (E&WJR). As the latter's headquarters were located at Stratford upon Avon and as the headquarters of the Stratford upon Avon & Midland Junction Railway were also based there, we have decided to provide addition generic and non geographical information on the SMJ including that relating to operations occurring in Northamptonshire, Buckinghamshire and Oxfordshire. the Northampton & Banbury Junction Railway (NBJR), authorised by an Act of Parliament on 9th July 1847, was originally intended to run from Northampton to Cardiff. In the event only the section between Blisworth (on the L&NWR main line, where it connected with the L&NWR's Northampton Branch) and Cockley Brake Junction, some five miles east of Banbury on the L&NWR's Buckingham Branch, was built opening on 1st June 1872, a length of fifteen and quarter miles. Intended to tap the ironstone deposits near Blisworth, it ran from Blisworth to Cockley Brake Junction where a connection was made for Banbury. the East & West Junction Railway (E&WJR), authorised by an Act of Parliament on 23rd June 1864, to open a line from a junction with the Northampton & Banbury Railway near Towcester to a junction with the GWR's Honeybourne to Stratford-on-Avon line at Old Stratford. The line opened in stages: from Fenny Compton to Kineton on 1st June 1871; and from Kineton to Stratford-upon-Avon on 1st July 1873. On the same day as the Kineton to Stratford-upon-Avon opened the line was also extended eastwards to join the NBJR near Towcester. Its earliest passenger coaches were bought secondhand from the L&NWR, and ran for several years in L&NWR livery before the company was able to find the money to repaint them. To this route was added the Evesham, Redditch & Stratford-on-Avon Junction Railway which was authorised on 5th August 1873. However due financial difficulties it only opened from Stratford-upon-Avon to Broom Junction, a length of seven and half miles, opening on 2nd June 1879. The Easton Neston Mineral & Roade and Olney Junction Railway, which ran from Easton Neston near Towcester to the Midland Railway main line at Ravenstone Wood Junction near Olney, also connected with the L&NWR main line at Roade. The company ran services between Broom Junction, Stratford-upon-Avon, and Banbury through Towcester to Blisworth and Olney and fashioned itself as 'The Shakespeare route'. The Stratford-upon-Avon & Midland Junction Railway came into being on 1st January 1909 and consolidated these lines into a 67 mile long system stretching from Olney via Towcester and Stratford to Broom and from Blisworth (for Northampton) to Cockley Brake Junction (for Banbury Merton Street). The Chairman was Harry Willmott and his son Russell Willmott was appointed both General Manager and Engineer. About the most exciting thing that ever happened to the company was when in the early 1900s the Great Central Railway ran four expresses a week for the benefit of Shakespeare enthusiasts during the tourist season, from the junction with its main line at Woodford Hinton to Stratford-upon-Avon. For much of the last quarter of the nineteenth century Sir Edward Watkin's eye would occasionally turned toward the SMJ as a possible way for the Manchester, Sheffield & Lincolnshire Railway to obtain its own line to Birmingham. The idea was that the Great Central Railway would use the SMJ from Moreton Pinckney to Stratford and then the North Warwickshire Railway from Stratford to Birmingham. This plan however came to nothing when the Great Western gained control of the North Warwickshire Railway in 1900. On 1st January 1923 the SMJR was, with other railway companies, grouped to form the London, Midland and Scottish Railway (LMSR). The line was to become an important asset to the LMSR since it provided a direct route, avoiding Birmingham, between the western line owned by the former Midland Railway and the main line south of Bedford. Excursion traffic used the route extensively between the First and Second World Wars. ¹. Soon after the Great Central Railway's London Extension was built in 1899 through passenger coaches were provided between London Marylebone and Stratford-upon-Avon; later a slip coach was used on the service. The line was single track throughout apart from passing loops: the countryside was undulating, and there were frequent changes of gradient and sharp curves, making it difficult to work for train crews. The track itself, until taken over by the LMSR, was mostly secondhand; because of this, the line was dubbed the Slow Mouldy and Jolty Railway by travellers. The railway owned 13 locomotives which themselves were old, and since they proved incompatible with the LMSR's modernisation scheme they had all been scrapped by 1931. The Edge Hill Light Railway, which began working to ferry ironstone in 1922, and closed in 1946, ran from Burton Dassett sidings, west of Fenny Compton. The line's original raison detre (that of conveying ironstone to the ironworks of South Wales) was ended when cheap Spanish ironstone ore displaced that from the Northamptonshire quarries. As can be expected in these circumstances, this brought about financial problems, and for a time in the 1870s the E&WJR was in the hands of the receiver. By 1911, however, the line was starting to show a reasonable profit. Lias limestone was conveyed from the Ettington Lime Works; but from the early 20th century it became important as a through route for freight of all kinds between the West of England and London. One such freight working, which the line became synonymous with, was the express banana train between Avonmouth Dock and St Pancras. Passenger services on the SMJR were generally sparse, with often just three or four trains operating each day. As part of the LMSR's experimentation in reducing the cost of running branch line services, experiments were carried out on the SMJR over several months during 1932 with a Ro-Railer, a bus converted to run on rails. This experiment proved to be a failure and the service was withdrawn in June 1932. The rural nature of the route meant that the railway always struggled to be profitable, a state of affairs best illustrated by past suggestions that the payment of dividends was closely linked to the amount of hay the railway could harvest from the land on either side of the route. The withdrawal of passenger traffic from the route because of road competition was therefore inevitable with passenger services between Broom and Stratford on Avon being suspended on 16th June 1947. The intermediate stations at Binton and Bidford were also closed temporarily but on 23rd May 1949 their closure was announced as permanent. On the 5th April 1952 regular passenger services between Blisworth and Stratford on Avon also ceased although because goods traffic still ran along the route the line was frequently visited by railway enthusiast specials. The honour for organising the very last passenger train to visit Stratford on Avon fell to the Stephenson Locomotive Society (SLS) whose special on 24th April 1965 finally brought down the curtain. On the 12th June 1960 the construction of the new junction with the former GWR Stratford to Honeybourne route, together with the upgrading of the junction between the former GWR Oxford to Birmingham line at Fenny Compton, meant that traffic for South-West Wales via the Stratford on Avon to Broom route no longer needed to utilise the section of line to Broom. This resulted in the Stratford on Avon to Broom route being closed on the same day although the two intermediate stations' goods yards had closed on 7th March 1960. The goods yards of the intermediate stations between Blisworth and Stratford on Avon were variously closed during 1963 and 1964. 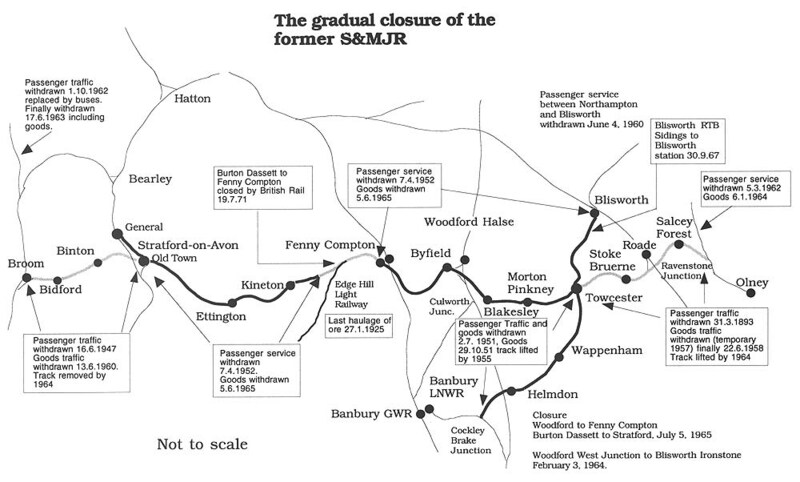 During the same period the South Wales ironstone traffic also declined which meant that the remaining SMJR route was finally closed on 5th July 1965, except for the section between Burton Dassett sidings and Fenny Compton which remained open to service the Ministry of Defence establishment. * Originally named Bidford until 1st July 1909. ** Originally named Warwick Road until closure in June 1873; reopened and renamed Burton Dassett Platform on 1st December 1909 until closure by July 1912; reopened and renamed after 1933. Much of the information provided on this and other linked pages has been derived from books written by: Arthur Jordan The Stratford upon Avon and Midland Junction Railway published by OPC; JM Dunn's The Stratford upon Avon & Midland Junction Railway published by The Oakwood Press; Messrs Preston Hendry & Powell Hendry in An Historical Survey of Selected LMS Stations Volume One published by OPC; RC Riley and Bill Simpson in their book A History of the Stratford-Upon-Avon and Midland Junction Railway published by Lamplight Publications; David Blasgrove in his book 'Warwickshire's Lost Railways' published by Stenlake Publishing which has a brief illustrated overview of some of the stations; Eric Tonks 'The Ironstone Quarries of the Midlands: History, Operation and Railways' published by Runpast Publications; and finally Geoffrey Kingscott's Lost Railways of Warwickshire published by Countryside Books which has a section dedicated to the SMJR with 'Now and Then' photographs. We would like to express our thanks to the members of the SMJ Society for use of their information and images, in particular the late John Jennings whose contribution can be seen on many of our SMJ pages.